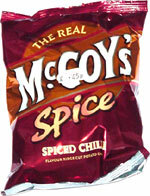 Taste test: McCoy's makes some of the thickest, crunchiest and most flavor-packed ripple chips on the market today. 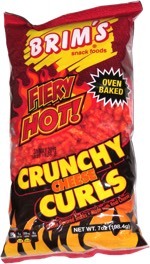 These are good, with a spicy (though not hot) flavor and a really great crunch. They taste like chili spices, but not like actual chili, as there's no meat flavor that I can notice. There's a spicy aftertaste. Smell test: Smells like chili powder, but not really like chili.